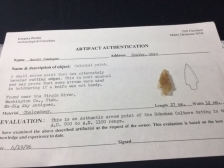 Made of Root Beer flint and recovered in Kendall County, this Early Triangular is semi-translucent, very thin, with collateral flaking. One cutting edge has fine pressure flaking from ancient resharpening. This is a very interesting artifact possibly used only in the hands and not hafted since all edges appear to be working edges. It has Bill German COA and I have the shipping.